At first you have to know that there is nothing impossible. Well, for every problem there is a solution.So, don’t give up, being persistant is what makes you able to keep trying although you have failed many time . Fear tells you how big your work or problem is. Fear is what makes you believe that its impossible to finish. But if you fear in life you cannot get what you want. will is a energy what makes us able to take action, when you get afraid , create a will of overcoming fear. 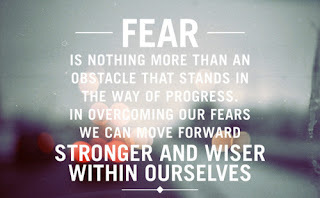 But fear is fear, if you are afraid, overcome your fear. But how ? Good question, ha ! I think among all the fear in the universe, ” fear of death” is the king of all fear. Everybody is afraid of death ! Even who wants to go to heaven don’t want to die. I am afraid of death too. I read in a book when I was 16 , that Understanding death is main and first thing Philosophy. The book ‘The importance of Living’ by Lin yutao was easy to understand. I read it in Assamese translated by Dr.Prafulla Kataki. So I was saying that death is the highest level fear. Do you believe that the monks and saints aren’t afraid of death ! I think they are afraid too but less than us. But some time the “fear of getting ashamed” becomes more scarier than the ” fear of death” Are you getting where I am going with this ? Everyday thousands of people die commiting suicide, I think lots of them die getting afraid of being ashamed. Many students commit that because of this fear of getting ashamed when they fail or secure low marks. Many rich people commit suicide when they loose money ,getting afraid of being ashamed ,when he have to be poor now !